Today, many small parts are processed in baskets or special fixtures to protect them during the cleaning process. However, many basket designs use stamped steel and internal mesh that greatly restrict cleaning agent flow and impingement energy. 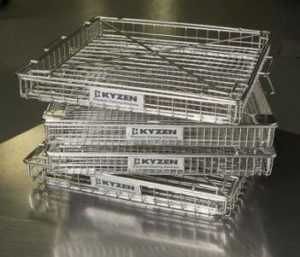 KYZEN’s custom designed wash baskets provides unrestricted wash solution flow that helps you get the most from your cleaning process. Cleaning is difficult if you can’t see the boards in the basket which is why KYZEN’s Custom Baskets are made with wide 1” or ½” mesh spacing for nearly unimpeded fluid flow. Click here to order.